Misfit recently announced its first smartwatch, the Misfit Phase, which marries analogue style with notifications and fitness-tracking smarts. The device marks the first smartwatch Misfit has made, but also the first wearable from the company since being acquired by Fossil. This makes Phase one of the many options in Fossil's plan to release 100 wearables by the end of the year. Both are reasons to be excited about the new device. If you need more details, here's everything you need to know about the Misfit Phase. Made of stainless steel with an aluminum body, the 41mm round face (the Phase comes in just one size) sits elegantly on display, as the Phase keeps most of the smarts behind the scenes. There's no crown like you'd find on other timepieces like Apple Watch Series 2, but two buttons on the right side similar to the Samsung Gear S3. The top button will let you scroll between "phases" (or better known as complications in the analogue watch realm). The phases let you switch between your activity stats, alarm, time zones and notifications while the hands move to provide the information. The hands pointing to six, for example, would indicate you've hit 50% of your daily goal. Meanwhile the bottom button controls all the integrations with Link, Misfit's app which gives its devices additional remote control functions. The Phase can be linked to most 20mm watch straps but Misfit will be making its own silicone and leather straps too. Specifically, there will be six styles to choose from - black, black and rose gold, rose gold, silver, navy and gold, and navy and grey. Phase's activity tracking is very similar to the Ray and Shine 2. With the 3-axis accelerometer, it's able to track your steps, sleep and distance, while giving you access to all the stats in the accompanying app. The watch is also water resistant to 50 meters so you can use it for swim tracking and keep it on in the shower. However you won't find a screen, heart rate monitor or apps. Similar to the Misfit Flash Link, you can use the Phase as a smart button. In the 'Smart Button mode', you'll be able to call your phone, take selfies, and control lights, music and other connected devices. The Misfit Phase lacks certain sensors but there's still a notifications system onboard. 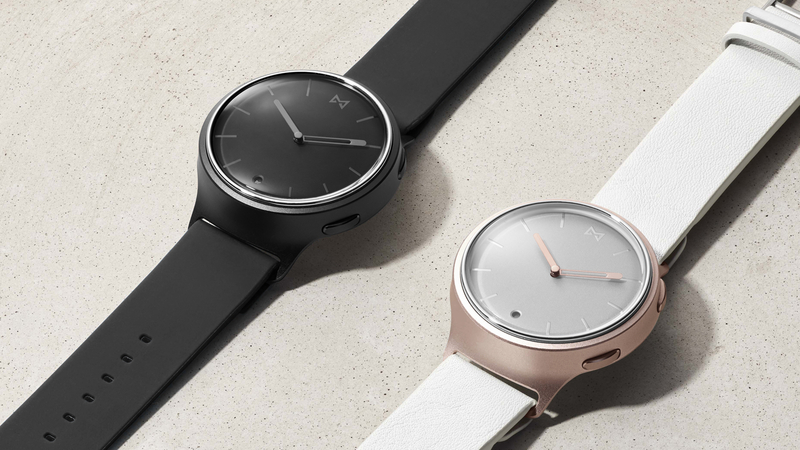 The analogue design means the Phase relies on its hour and minute hands to inform you of an incoming call, text or other update, alongside a little buzz. You'll also need to use the Phase app for various customizations. For instance, the app allows you to assign numbers on the Phase to show you who's calling, texting or emailing you. There's also a small window toward the bottom of the face, with a color wheel behind it that shifts depending on the type of notification you have. With six colors, you can assign one color to a specific notification. For example, you could make texts red then assign noon to a friend. If messages from that friend come in, the hands will move to noon and the window will turn red. The idea was to create something that delivered notifications in a more discreet and personal way to display-based smartwatches, which often let all onlookers see, Misfit VP Preston Moxcey told Wareable. One major benefit of the Phase not having a screen is an extensive battery life. You'll get six months of power before you need to replace the CR2430 coin cell battery. This is the same route Misfit's gone with its other trackers and it seems the company's sticking with it for the smartwatch. The Phase costs $175 with the silicone strap, $195 with the leather. It's up for pre-orders now from online retailers including Misfit and Amazon and starts shipping out 1 December. Misfit says the watch will also be sold in traditional watch stores and jewellers in the new year.